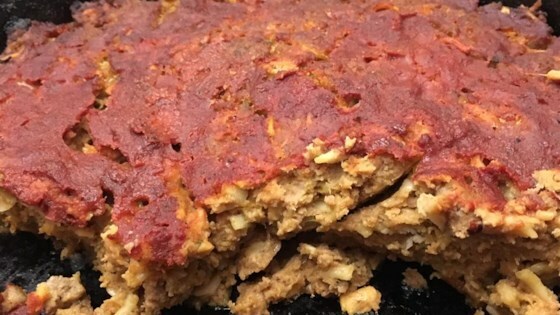 "This meatloaf is now considered our family recipe for the perfect meatloaf! With a little of this and a little of that, it yields just the right amount to satisfy even the pickiest of eaters! No more soggy meatloaves! Making plenty of leftovers is key for this delicious meatloaf! Something new to add to your recipe box! Yummy for any occasion!" Place a large cast iron skillet in the oven. Preheat oven to 375 degrees F (190 degrees C). Combine ground beef, Italian bread crumbs, noodle soup mix, 1/2 the tomato sauce, eggs, onion, ketchup, cracker crumbs, 1 tablespoon Worcestershire sauce, barbeque sauce, steak sauce, salt, 1 1/2 teaspoons black pepper, 1 teaspoon garlic powder, and 1/2 teaspoon onion powder in a large bowl; mix well. Mix remaining tomato sauce, 1 tablespoon Worcestershire sauce, 1/2 teaspoon black pepper, 1/2 teaspoon garlic powder, 1/2 teaspoon onion powder, and cayenne pepper in a small bowl until topping is smooth. Remove skillet from the oven. Place ground beef mixture in skillet, smoothing the top. Spread topping over beef. Bake in the preheated oven until beef is mostly cooked through, about 1 hour 30 minutes. Remove from oven and drain off grease. Return to the oven and continue cooking until meatloaf juices run clear and an instant-read thermometer inserted into the center reads at least 160 degrees F (70 degrees C), about 1 hour more. Remove meatloaf from oven and allow to cool for 15 minutes before serving. I made this with organic ground turkey meat. My family enjoyed it and I would definitely make it again. I made it with ground turkey and. cooked it for 1hr 30 min and it was great. Definitely a keeper.